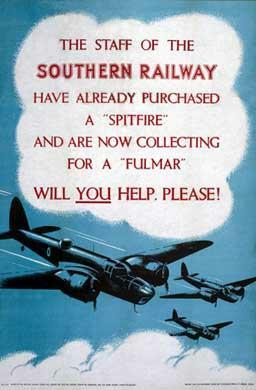 World War II poster extolling the Southern Railway's staff's payment for a Supermarine Spitfire and encouraging the further purchase of a Fairey Fulmar. The Fulmar was produced between January 1940 and December 1942 so that helps us date this image. Curiously the plane featured is neither a Spitfire nor a Fulmar. It seems to be some indeterminate (well I don't recognise it) twin-engined bomber. The Fulmar was a single-engined carrier-borne aircraft that flew with the Fleet Air Arm. There is a more detailed poster exhorting the Southern's employees to contribute here.